This year looks to be Nintendo's toughest. Nintendo, however, is looking to change that. Respected Japanese newspaper Nikkei reports that within this year, Nintendo apparently plans to use smartphones to win back gamers. Well, kind of. According to an unconfirmed Nikkei report, Nintendo plans to release trailers for new games on smartphones (presumably Android and iOS) as well as "free mini-games." Until now, Nintendo hasn't made any gaming content available on smartphones. Note that the Nikkei does not use the Japanese word for "demo," which is either "taikenban" (体験版) or "demo" (デモ). It explicitly states "muryou no mini geemu" (無料のミニゲーム) or "free mini-game." Nikkei reports that the idea is that if players enjoy the mini-games, they can purchase the actual software for their Nintendo hardware. That sounds awfully like a demo! Nintendo will apparently make a wide swath of information about its games available via smartphones—such as introducing the game's story and characters as well as the release date and price. Nintendo is expected to announce this plan later this week, Nikkei adds. In the past, Nikkei's track record with Nintendo rumors has been quite good. Kotaku is following up with Nintendo and will update this post should the company comment. Gossip! Rumors! What Is Nintendo&apos;s Track Record? 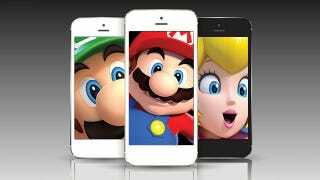 Nintendo president Satoru Iwata has previously said that the company would use smartphones to help promote their games. In October, addressing whether Nintendo handhelds were losing out to smart phones, he told company investors the following: "I feel that we should make an effort to take advantage of [smart devices'] existence. For instance, we already made it possible to browse Wii U's networking service called Miiverse on smart devices. Starting with this attempt, we are discussing among us how we can expand the use of smart devices to help drive the business of dedicated gaming systems.... Twitter timelines filled with tweets about Monster Hunter and Pokémon can certainly help create awareness for the products, and we also know that many watch Nintendo Direct on their smart devices. Rather than simply viewing smart devices as competitors, we should consider ways in which we can use them for our business." "I think it is natural that many people feel that it is more convenient to use smart devices, as opposed to dedicated gaming systems, to play games to kill a bit of time. That is to say, there are some areas in which dedicated gaming systems were once used that now have greater potential on smart devices. On the other hand, dedicated gaming systems are developed by considering the software that is designed to run on the hardware, enabling us to make unique propositions."